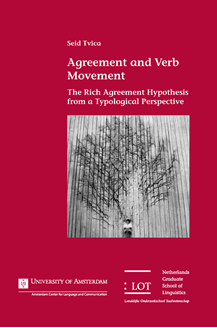 This thesis investigates the so-called Rich Agreement Hypothesis (RAH), the hypothesis that correlates the syntactic position of the verb with properties of subject-verb agreement morphology. While the RAH has been found to make correct predictions in many Indo-European languages, little remains known about the extent to which it holds beyond Indo-European. In an approach that combines linguistic theory and typological methodology, Formal Generative Typology, the author evaluates the RAH in twenty-four genetically distant non-Indo-European languages. The analyses show that there is strong evidence in support of the hypothesis in most languages, whereas in a small subset of investigated languages, the RAH cannot be evaluated. While the study affirms the validity of a growing trend of conducting typological research in the context of a theoretical framework, the outcome of these analyses places the RAH in a position of a potential (abstract) universal. This thesis is relevant to scholars working on the general theory of verb movement and its relation to the morphological properties of the verb. More broadly, the study contributes to the understanding of the interaction between syntax and morphology and is of interest to a general syntactic and typological readership.